If the three sides of a triangle are the same size the triangle is equilateral triangle. 1) All sides are equal. 3) Every altitude is also a median and a bisector. 4) Every median is also an altitude and a bisector. 5) Every bisector is also an altitude and a median. If two of the sides of a triangle are of equal size the triangle is isosceles triangle. The altitude to the unequal side is also the corresponding bisector and median, but is wrong for the other two altitudes. It is also true that the median for the unequal sides is also bisector and altitude, and bisector between the two equal sides is altitude and median. 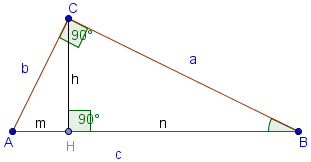 A triangle with a right angle(90°) is called a right triangle. Triangle ABC is similar to triangle CBH because they have one right angle and angle B is common(two equal angles). Triangles ABC is similar to triangle ACH because they have one right angle and angle A is common(two equal angles).